I’ve heard that mitochondrial and Y chromosome DNA are useful for finding out whether two people are distantly related, but what makes these types of DNA better than regular DNA for learning about someone’s ancestry? You heard right! Those two kinds of DNA can tell if you and I share the same relative from tens of thousands of years ago. The rest of our DNA, the autosomal DNA, is only really useful going back 5 or 6 generations. DNA tests that look at ancestry or relatedness work by looking at changes in DNA over time. Most of your autosomal DNA changes pretty quickly. Mitochondrial DNA (mtDNA) and DNA from the Y chromosome (Y-DNA), on the other hand, stay very similar for long periods of time. This means we can trace these two DNAs much further back in time. Y-DNA and mtDNA can’t tell you everything, though. Only males have the Y chromosome, so you can only trace back your paternal line. And mitochondrial DNA is handed down from mother to child, so it can only tell you about your maternal ancestors. What I’ll do for the rest of the answer is explain why people from the same place tend to have some of the same DNA, especially Y-DNA and mtDNA. And how we can use differences in DNA to tell where someone came from. People from the same region tend to share more DNA than they do with people from more distant places. You can see these similarities in their DNA. The reason for this is that way back when, people didn’t move around much. Imagine a group travels from Africa to Europe and settles there. This is in fact what happened 100,000 or so years ago and is where all of the original Europeans came from. For a long time, hardly anyone else moved in. Everyone’s DNA came from that same original set of explorers. So it is like your family but on a really big scale! If this were all there was to it, it might not be enough to tell someone’s ancestry from their DNA. Everyone’s DNA would be too similar. You need one more thing—new DNA differences that spring up in one region and not another. Part of the difference between someone from Africa and someone from Europe has to do with the fact that our DNA can and does change over time. Not a lot but enough to track. Think of your DNA like a really long book. 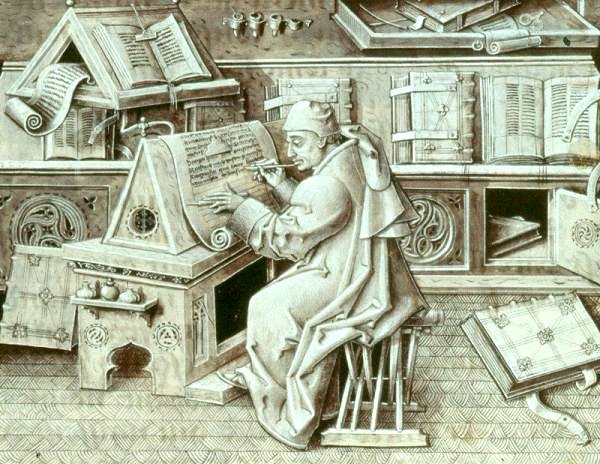 Centuries ago, before printing presses were invented, books were copied by hand by monks in monasteries. And the monks sometimes made mistakes during copying. Imagine that a monk leaves to found a new monastery and takes one of these books with the mistake. Now every book from that monastery will have that same mistake. The same thing happens with DNA. Mistakes can and do happen in the DNA as it is being copied inside your body, and those “mistakes,” called mutations, are handed down to future generations. If a monk copying a book in Europe makes a mistake, all of the European copies of that book from that point on will have the same mistake. But these mistakes will probably be different than the mistakes made by monks in Africa, for example. If an archaeologist found one of these books, he would be able to trace it back to the monastery it came from. If it has the mistake that the African monk made, it came from Africa. And if it has the European mistake, it came from Europe. It’s the same with DNA. People that share ancestors from the same part of the world are more likely to have the same “mistakes” in their DNA. And we can trace where you are from by looking at these mistakes. This is all well and good, but why can you trace the DNA from the Y chromosome and the mitochondria further back in time than you can with the rest of your DNA? The reason has to do with something called recombination. This is basically some DNA shuffling that happens when DNA is passed from parent to child. Let’s go back to our monk’s book. Something closer to reality would be if the monk always had two copies of the book, maybe one with the mistake and one without it. And before he passes it on to the next monastery, he takes pages from each to create a new book. For example, he might take the first half of the book and combine it with the second half. Or maybe just chapter 1 from the first book and the rest from the second. Or basically any other possible combination. Ok so now you have a book that may or may not have the mistake. So because of this page shuffling, some of the time you couldn’t tell that the book came from the European monastery even though it did. This sort of thing happens in people, too. Our DNA is broken up into 23 pairs of chromosomes. You get one of each pair from mom and the other from dad. Before you pass your DNA on to your child, DNA gets swapped between the two chromosomes in a pair. This happens generation after generation. As you might imagine, the DNA gets hard to track over time. The only bits of our DNA that don’t do this are the Y chromosome and the mitochondrial DNA. Only males have Y chromosomes, so they’re handed down from father to son with no swapping. Same with mitochondrial DNA, which is handed down from mother to child with no recombination. This is why we can trace each so far back into the past. They do get the smaller mistakes we were talking about, but they don’t get garbled over time through recombination. But because of the way they’re inherited, neither can tell you the complete story. Y-DNA and mtDNA are pretty good for answering questions about ancestry. But they have some limitations. A drawback with Y-DNA and mtDNA comes from how they are handed down between generations. Since the Y chromosome is passed from father to son, you can only get information about paternal ancestors. A son can trace his Y-DNA back to his father and his father’s brothers and his father’s brother’s son. And back to his father’s father and his brothers and sons and grandsons and so on. But he learns nothing about his mom’s ancestry from the Y chromosome. And nothing from his dad’s mom’s ancestry and so on. Huge amounts of his ancestry are completely invisible using Y-DNA. Mitochondrial DNA is similar because it is passed down from mother to child. So looking at mtDNA can only give you information about your mother, grandmother, great-grandmother, and so forth. Also, these types of DNA aren’t as good for finding out if people are closely related, like parents and their children, or siblings. Too many people share identical versions of these types of DNA. Are you related to Genghis Kahn?